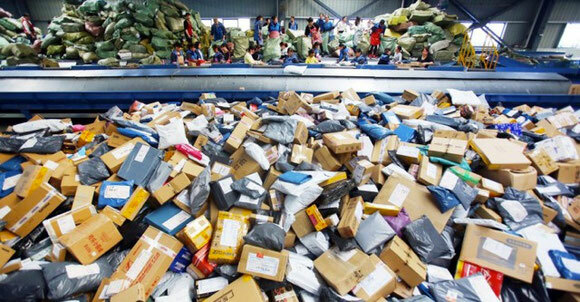 Data from the China State Post Bureau (CSPB) show that postal enterprises received 243 million packages on December 12, a 38% increase from last year. The "Double 12" sales holiday in China follows on the heels of the "Double 11 Festival" (from November 11 to 16) which last month generated a peak volume of 1,496 billion packages, up 33.6 percent from 2016. According to the CSPB, major delivery enterprises, such as Alibaba and JD.com, "made preparations in their warehouses to provide the capacity and personnel needed on this year’s Double 12." Companies continued the measures taken during the Double 11 Festival and paid special attention to link services and security work to ensure shipments were safe and on-time. However, several delivery companies warned that the cold and snowy weather during the next few days would cause slow deliveries in northeastern China, Inner Mongolia and Xinjiang. The figures from the two sales festivals confirm the unabated trend of online purchases by Chinese consumers and businesses, which in turn is driving parcel delivery volumes higher each year. The parcel delivery growth in the first half of 2017 totaled 17.32 billion units, a 30.7% increase from a year ago, according to the CSPB. While 98% of those deliveries originated in China, there were 360 million international parcels delivered in the first half, a 29.2% increase over the same period a year earlier. China’s growing middle class covets imported goods, and the country’s leading e-commerce operators have responded by creating special sections of their e-commerce sites where consumers can order goods from abroad that enter China under relaxed cross-border e-commerce rules. Those rules don’t require the certifications demanded when retailers bring goods into China in bulk, a report by Digital Commerce360 said. For example, Alibaba Group Holding Ltd., whose Taobao and Tmall online marketplaces account for roughly 70% of Chinese online retail sales, has created the Tmall Global marketplace featuring goods from 14,500 international brands. JD.com Inc. operates the JD Worldwide marketplace with some 10 million items from abroad, and the Amazon China unit of Amazon.com Inc. has a special area called Haiwaiguo, which means “shop from abroad” in Chinese. JD.com is China's leading Internet retailer and Amazon China is No. 4. Alibaba is not ranked because it is not the merchant of record for goods sold by the millions of merchants selling on its marketplaces.